Employment outcomes for MGNREGA vary significantly across states, despite similar implementation mechanisms. Research indicates that MGNREGA implementation relies on the supply of work provided, rather than the demand for it. ‘Political commitment’ to policy implementation is often conspicuous by its absence. Technical, apolitical factors are prioritised, leading in turn to technocratic solutions. There has also been a tendency to attribute policy success or failure to institutional design. This briefing ‘brings politics back’ into the study of policy impact, by examining the impact of power dynamics among classes at the level of implementation. Researchers studied political commitment in four states, and class relations in two states. 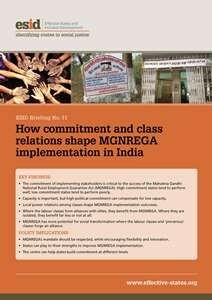 The aim was to better understand the factors behind MGNREGA implementation outcomes. The components of political commitment were analysed in the states of Bihar, Assam, Andhra Pradesh and Chhattisgarh, both in relation to each other and to state capacity. Power dynamics among the labour classes and two sub-groupings of elite classes were studied in relation to MGNREGA implementation outcomes.